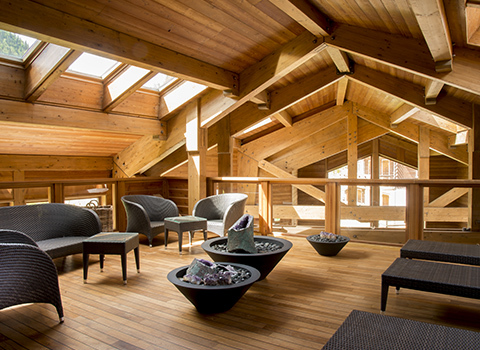 Cristal Spa offers 450m² of wellness in the centre of La Clusaz. From the moment you arrive you can admire the pure lines punctuated by natural elements of wood, Aravis stone and oak wood floors. Experience a moment of relaxation in perfect symbiosis with the surrounding nature. A majestic bathing pool with wide French windows instantly invites you to plunge into this sanctuary of wellness and total escapism. There is a challenging counter current, a hydrojet space for the legs and a massaging Jacuzzi. Why not continue with the dry heat of a sauna just a few metres away for a lighter, more cleansed body. 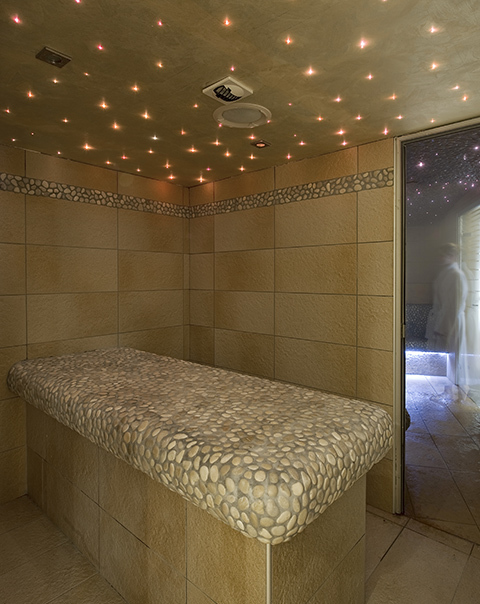 Or if you prefer, the heat of the hammam to relax the muscles and cleanse the skin to eliminate toxins. 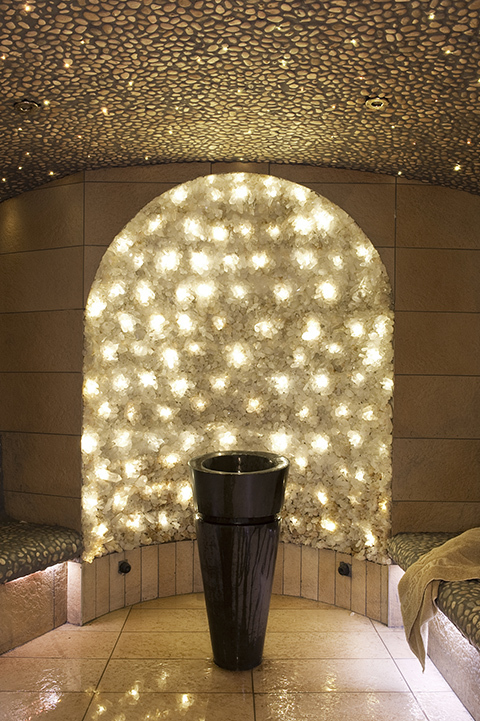 The hammam is the centerpiece of the spa, shaped like a grotto covered with sparkling rock cristals. It is an extraordinary place where stress and tensions disappear, absorbed and relieved by the pure and powerful energy within the minerals maintaining balance between mind and spirit. For the comfort of all residents, access to the swimming pool for children is strictly between the hours of 9am to 10am and from 4.30pm to 7pm and Wednesday all day. As soon as you glimpse the reception you will be seduced by the pure lines of the decoration, combining neutral colours with wood, to remind us that the Mountains are just outside the Cristal Spa. 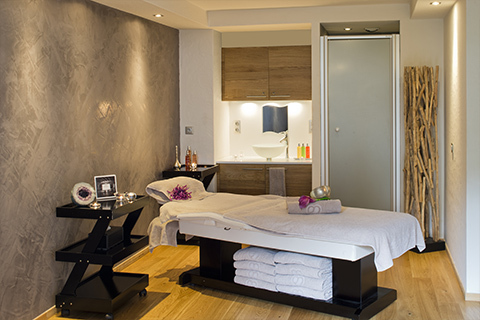 A haven of serenity throughout the 6 treatment rooms. 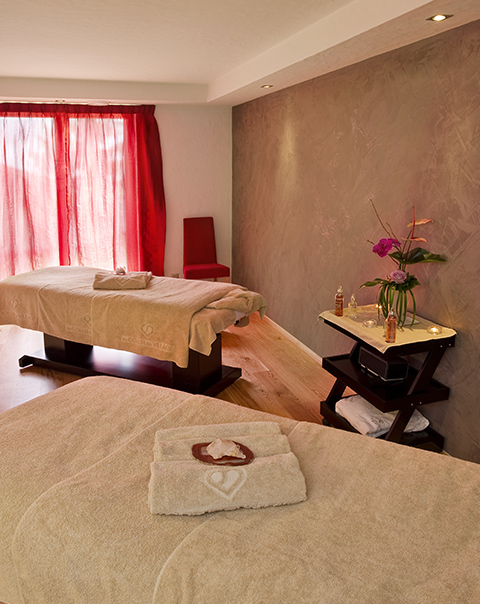 The Duo room is a place where couples or friends can share their special moment thanks to 2 massage tables. In keeping with the tradition of hammams, the body rituals table is heated and covered in pebbles under a starlit sky. An ideal space dedicated to body rituals. The 4 other treatment rooms are decorated in different warm hues inspired by nature.